5X Marble Polishing Powder is a blend of high quality Italian polishing materials. Dia-Glo buffing compounds are specifically formulated to achieve the best possible finish on stone surfaces. 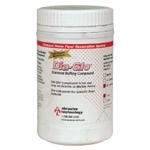 Dia-Glo S is a polishing powder formulated to obtain a high gloss polish on black granite. If used regularly, Grey Potea prevents the deterioration of the shine by the abrasion caused by the high foot traffic and footprints. Gialotex is considered a "general purpose" product providing the highest level of shine on most existing marbles and terrazzos. If used regularly, White Potea prevents the deterioration of the shine by the abrasion caused by the high foot traffic and footprints.